There are 27,200 nurseries and pre-schools in England, offering places to 1 million children. They cover 80% of all childcare places on Ofsted’s Early Years Register (EYR). The remaining 20% of places are provided by childminders (19%) and childcare on domestic premises (less than 1%). With more than 9 out of 10 providers judged good or outstanding, the level of quality in the sector is high. This blog looks at how staff qualifications contribute to overall quality of the sector and how that varies across different areas of deprivation. We also consider why the picture is complex and recognise the need for further work. What does the workforce look like in England’s nurseries and pre-schools? Ofsted collects information on staff qualifications when a provider registers and this information is updated when an inspection takes place. In order to look at the relationship between qualifications and inspection outcomes, this analysis only includes nurseries and pre-schools that had received an early years inspection. On 31 March 2018 around 221,300 staff worked in nurseries and pre-schools that had been inspected in England. The majority of staff (74%) are qualified at level 3 or above (A level or equivalent). What impact does a qualified workforce have? Looking at staff qualifications and provider’s most recent overall effectiveness judgement it is clear that settings with higher proportions of staff qualified to level 3 or above are more likely to have been judged good or outstanding at their most recent inspection. This trend is most visible when looking at outstanding providers where, for those with at least 80% of staff qualified to level 3 or above, 26% were judged outstanding. In contrast, for providers with 20% or less of staff qualified at level 3 or above, only 12% were outstanding. Where are qualified staff working? When looking at how staff qualifications differ between providers in differing areas of deprivation (using income deprivation affecting children index, IDACI) the largest differences are found in proportions of qualified staff between the ‘most deprived’ and ‘least deprived’ quintiles. Specifically, 49% of providers in the ‘most deprived’ areas had at least 80% of staff qualified at level 3 or above, compared with 43% of providers in the ‘least deprived’ areas. However, despite this, providers in the ‘least deprived’ areas were more likely to be judged good or outstanding compared with those in the ‘most deprived’ areas. This highlights that staff qualifications are not the only factor influencing the quality of early years provision. This is supported by other studies, such as a report by the Nuffield foundation, which found that a nursery having qualified teachers or early years practitioners is not a strong predictor of children’s outcomes. It appears that staff qualifications are likely to be just one part of a more complex picture when looking at the factors impacting nursery and pre-school inspection outcomes. In April 2017, the minimum requirements for literacy and numeracy qualifications were broadened in an attempt to reduce the difficulties in recruiting staff. This may have an impact on staff numbers because more individuals may have the opportunity to gain a level 3 qualification. 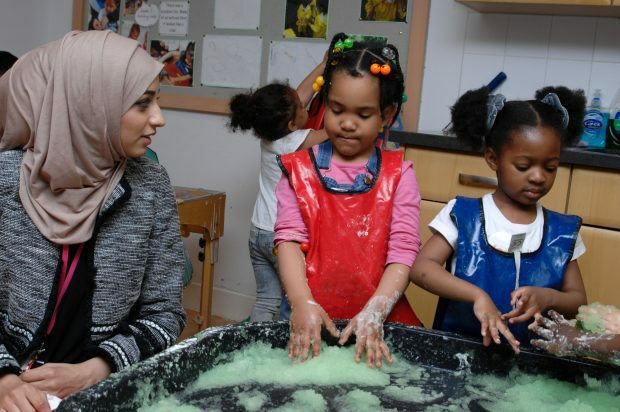 The Department for Education has published the Early Years Career Pathways for staff already working in the early years sector to support their career development and for those interested in working in the sector to see the range of job roles on offer. We will continue to develop our analysis to look at how staff qualifications and other factors influence the quality of nurseries and pre-schools. As ever, we welcome your thoughts. To clarify, and following the initial publication of this blog, nurseries and pre-schools refer to childcare on non-domestic premises. Follow Jason on Twitter: @JRbradbury. - The article would have been improved if you had also included a summary of the actual data (or a link to it) so the reader can form an independent view of what conclusion to draw. - It isn't clear from the article what kind of qualifications are being referenced. Are these Level 3 qualifications (or Level 1/2, as the case may be) specifically related to childcare or Early Years provision? - It may have been helpful to also make a comment on whether there is any requirement for nurseries to employ qualified staff (for context). Thank you for this extra information. If the qualifications link to practical work in nurseries then they are more likely to be useful in my opinion. Training in settings is important- all the reading and research may not help in challenging situations or help maintain attention, deescalate or motivate learning. However statistics are also often flawed - deprived areas often have lower entry levels for language and learning and attendance which can affect how outstanding a setting is deemed to be. Hi, Data used in the blog does include out-of-school settings. The article states “There are 27,200 nurseries and pre-schools in England, offering places to 1 million children” if the data includes out of school clubs then the sentence is misleading at best and factually incorrect at worst. This sentiment is repeated throughout the post. Id really like to know the impact on our of school settings and how many out of school are in the early years register. This type of post highlights why Ofstef should make provision to measure them separately. Hi, Nurseries and pre-schools refer to ‘childcare on non-domestic premises’, which includes out-of-school settings. ‘Nurseries and pre-schools’ is more user-friendly language than ‘childcare on non-domestic premises’. However, this was not clear in the original article, so we have now added a footnote to clarify this. For more information on childcare providers and inspections please see our official statistics: https://www.gov.uk/government/collections/early-years-and-childcare-statistics. Thank you for adding the clarification. I think it is really important that this point is clearly articulated. Nursery and pre-school clearly suggests children of under-school age. Registration on the EYFS covers all After School, Breakfast and Holiday clubs who accept children in the Reception Year. It is still not clear if the 27,200 places includes all the children who use wraparound care who are not in the Reception year (i.e. those who are aged 5-11 but attend a club that is registered on the Early Years register). The clarification does make this a little clearer, thank you. Has data been collected regarding outcomes for children and the numbers of staff in settings who have a grade C or equivalent in GCSE Maths and English? Hi, This type of specific data has not been collected. I think this blog is very misleading. It suggests qualifications do not make a difference but does not distinguish between qualifications such as EYP, EYT and QTS but seems to merge them together as all being graduate qualifications. They are very different. If a provider has an Early Years Inspection it is less likely to have staff with Qualified Teacher Status. It is also not helpful to only refer to a part of the Early Years Sector. Studies in the Maintained Sector have shown that staff with QTS do make a difference to children's outcomes. Hi, thank you for your observations. We disaggregate data based on what we have captured during inspection. We acknowledge that this is only part of a complex picture and that lots of other factors play a part and we continue to develop our analysis.